Choral Ensemble reaches out to the community with song! Led by director, Wendy Fentiman, the Choral Ensemble performs at independent living centers and private parties in Sun Cities area. The twenty-five men and women sing a variety of songs, including blues, patriotic, gospel, songs from movies, country music, etc. Accompanied by piano, other instruments (violin, clarinet, flute, rhythm instrument, etc.) are used for many songs. 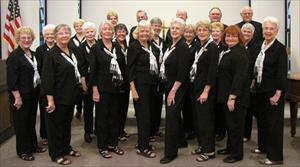 If you wish to book the Choral Ensemble for an event, contact Wendy Fentiman at 623-584-4602.